All you germaphobes, you might not want to read this: Boosting bacteria in drinking water may improve health – health – 10 August 2012 – New Scientist. Or the post here at the microBEnet blog a few days ago from David Coil about this same topic. The article discusses a paper from Lutgarde Raskin’s group at U. Michigan. The paper apparently discusses possible ways to manipulate the microbial content of drinking water – such as to increase the abundance of some microbes to somehow outcompete microbes that are bad for us. I am skeptical of the claims – not that they are impossible – but more that this would be a very tricky operation. Nice if they can do it. But probably very tricky and risky. Alas, I don’t actually know exactly what they are proposing. Why? Because their paper is in some American Chemical Society journal I do not have access to. Here’s a general suggestion though: if you want to influence public health and get people to purposefully put bacteria into drinking water and get the public’s approval for such actions, you might want to not live in some ivory tower where only other academics can read your work. I for one am not interested in paying $35 for 48 hour access to your paper. Ridiculous. As much as we wish Open Source publishing was more widespread, it isn’t universal yet. 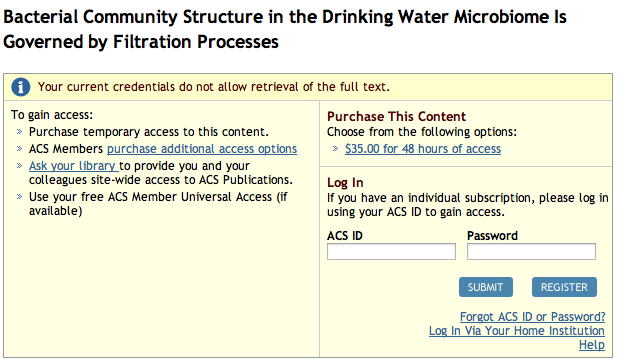 Send me an e-mail (raskin at umich.edu) and I will send you a reprint of our paper in Environmental Science & Technology (Pinto, A. J., C. Xi, and L. Raskin, 2012, Bacterial community structure in the drinking water microbiome is governed by filtration processes, Environmental Science & Technology, DOI: 10.1021/es302042t). You can also get access from ACS, but it is a bit of an effort – see for their policy and process for gaining access. engineer drinking water treatment plant processes to help change the drinking water microbiome (filters as we suggest in this study may be the easiest target, but there are other options). We hope you will read our ES&T paper and comment. Thanks for the comments and offer for a reprint. I note – you don’t have to publish in such journals even if others in your field do. There are plenty of places that have open access options. Thank you very much for the comments and the link. Any chance of you posting the paper to your web site to that everyone can get access? This is an interesting topic and one that deserves more attention. What leaves the water treatment plant, of course, is not necessarily representative of what reaches our faucets, shower heads, or hose bibs. But it is what starts out the journey from treatment plant to homes served by that system’s treatment plant. I found one of the interesting points, stated in the abstract, that pH is an important determinant of the microbiome of the filter and water leaving the plant. Note, of course, that water treatment plants do not normally test for any bacteria other than E. coli, not very good assurance of the quality of water leaving the plant. I’d be interested in your comments after you have read the article. It seems that the “biodiversity is good” notion might be applicable here. But it also suggests that we ought to learn a lot more about the microbiome of the water that reaches water meters and plumbing fixtures in the bathroom, laundry and kitchen. Maybe in the garden too. Here is the abstract of the article — not copyrighted. Environmental Science & Technology (ES&T) is available to all UC campuses. It is hardly an obscure journal, and I would assume that all university-based researchers in America and beyond have access to it through their libraries’ journal subscription services. I think we (microBEnet) can be helpful to those who do not have “ivory tower” access privileges. Some of my own approaches and practices might work for most folks who want to see Lutgarde Raskin’s (or any other restricted access) publications. The current case is an excellent example, and in other cases, I have almost always succeeded in obtaining a reprint — digital or otherwise. Even in the case of very old articles that are not available in digital format on the publisher’s web page, many authors have scanned their own papers and will gladly send them in response to requests. Books and book chapters are more difficult, but even there, authors are generally very cooperative. I have university library access to some but not all non-open-access journal articles that I find on the web through my searches (certainly less than those at the University of California or other large North American institutions.) When I find an article that is in a journal that I can’t access with privileges, I send the author a short email requesting a copy. It is a very rare occurrence that I don’t receive a copy of the requested article, almost always within 24 hours of my request’s having been sent. Authors want their work read as widely as possible. They are generally happy to comply. (http://pubs.acs.org/doi/abs/10.1021/es302042t.) Raskin appears willing to send copies. It turns out that 50 copies of articles in ES&T are available to authors to distribute, e.g., in response to requests such as what one might make if interested in this article. So, even if you do not have access to some article you see mentioned in posts on the microbe.net web site or on our mendeley group (microbiology of the built environment) page (http://www.mendeley.com/groups/844031/microbiology-of-the-built-environment/), don’t despair. With a little diligence and a short email request to the author, you can probably access something in excess of 95% of the literature, open access or not. If you have some other suggestions about gaining access to journal articles, please post them on microbe.net. We are very interested in broad access to the scientific literature relevant to the microbial ecology of the built environment. Sure one can suggest ways to get access to articles that people don’t have access to. But that is a short term work around to a much bigger problem. What I think we should do at microBEnet is help work to change the system such that open access to the literature is broader, easier, and the rule not the exception. And that is in fact part of our mission at microBEnet. Our mission is NOT about the short term goal of getting a few people access to a few papers here and there. So in fact I do not think it is particularly useful to teach people about how to email authors to get copies of papers. I do think it is VERY useful to write about findings in open access papers so that the authors of those papers get rewarded to sharing their results broadly. And at the same time ANY reader can have access to the work. I also think it is VERY useful to point out, when we write about non openly available papers, that the papers are not broadly available. And we should make it clear that that is less that ideal. Which is what I was doing here. I also think that we are all very busy and we should use the money we have obtained from the Sloan Foundation carefully and thus when I take the time to write a blog post I do not just write about anything that comes to my head. I do not just write about any story I see relating to microbiology of the built environment. I skip over stories about work that is not openly available because I have a list of 100 things I need to do for this project. And I only rarely will take the time to “promote” work from non openly available publications. So – sure – we can teach people how to get access to papers published in journals like the one here. But that takes time away from other tasks. And it takes a short term view on this field. We have a chance – right now – to help shape a growing field. One paper here or there is not going to make the field. One news story here or there is not either. But we have a chance to help make this field be more open than other areas. We have a chance to teach people about the benefits of openness. And about how easy it is to be more open without any cost to ones work or career. So – in my few minutes here or there I will always take the opportunity to promote good “open” work. And I will always take the opportunity to point out the problems that can come from not being open. Kudos to you for calling b.s. on the ivory tower ‘herrenvolk’. Don’t allow yourself to be bullied or deflected by their tactics.